MitoQ Specials are specifically targetted towards helping support conditions where CoQ10 is commonly used in Medical practise: for heart disease, and to help stabilise blood sugar. MitoQ Heart is a ground-breaking formula for heart and circulatory health. It features our patented, scientifically proven anti-oxidant, MitoQ, which is 847 times better than CoQ10 at targeting heart mitochondria. It also contains L-Carnitine, Magnesium and Vitamin D - essential heart health ingredients. 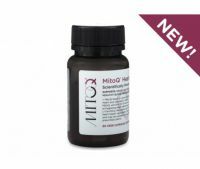 MitoQ Heartsupports energy levels and may be suitable for people who have been prescribed statins. Delivers CoQ10 into the mitochondria, supports endothelial function, supports normal blood pressure, heart rate and cardiovascular protection. Magnesium: Like a spark plug central to the process, Magnesium “turns on” the enzymes that drive the entire metabolic reaction of ATP energy generation. Vitamin D3: protects hearts via several different mechanisms. It has been shown that normal Vitamin D levels are associated with a healthy cardiovascular system. MitoQ Blood Sugar is a ground-breaking formula designed to support natural sugar metabolism, healthy insulin levels, weight management and organ health. Balanced blood sugar levels can reduce oxidative damage to the cells and mitochondria that may lead to many health issues longer term if left unaddressed. MitoQ Blood Sugar helps protect the pancreas, kidneys, liver, eyes, brain, and heart and also supports peripheral nerve and circulatory health. Despite a healthy diet and exercise regime balanced blood sugar levels can become an issue with age, creating weight management issues and a cascade of health issues down the track if left unaddressed. MitoQ Blood Sugar also contains MitoQ which is a mitochondrial-targeted antioxidant designed to protect mitochondrial membranes from free-radical damage. It is 847 times more powerful than other preparations of CoQ10. MitoQ targets and reduces oxidative damage so the mitochondria, cells, organs & vascular system can function optimally. Repairing oxidative damage supports the function of organs such as the heart, pancreas, liver, kidneys, brain, eyes & the circulatory system. It has been shown to support normal blood sugar and glucose metabolism in several studies. Chromium is needed to regulate blood glucose and reduce sugar cravings. Research studies support intervention with chromium supplements to support healthy glucose metabolism. Chromium also supports energy production and weight management, and supports cardiovascular health and healthy cholesterol levels. Chromium is a commonly deficient mineral due to the high intake of refined and sugary foods in modern diets. Chromium Picolinate is the most effective form of Chromium to support blood sugar levels and is absorbed better than other forms. Zinc plays an important role in blood sugar metabolism. It is involved in the production, storage and release of insulin from the pancreas. Zinc Amino Acid Chelate is a very good source of bioavailable Zinc. Recent studies have shown that cinnamon supports glucose metabolism at the cell receptor site. Supplementing the diet with concentrated, standardised cinnamon may support healthy blood sugar balance. Other studies show cinnamon helps support healthy cholesterol levels. It is also a powerful antioxidant to help protect against the damaging effects of glucose on the cardiovascular and other body systems. MitoQ Liver is a ground-breaking formula featuring patented MitoQ, which is 847 times more effective than CoQ10 at targeting liver mitochondria. It helps repair oxidative damage to hepatocytes and supports healthy liver function and detoxification when taken daily. It also contains Siliphos Milk Thistle, selenium, and choline, essential liver support ingredients. Standard Milk Thistle extract is known to have poor absorption, however Siliphos Milk Thistle is complexed with phospholipids to significantly improve its absorption: due to this it is proven to be 10x more bioavailable than standard milk thistle extract. Fortunately, our liver is capable of self-regeneration; however, this process can be overwhelmed if free radical attack is constant or if weight gain, alcohol, toxins, medications, viruses or illnesses inflict severe damage. Sometimes a little extra help is needed to support healthy liver function. Always read the label and use as directed .Do not exceed dose unless directed by your physician. Consult your physician if you are pregnant or nursing. If symptoms persist see your healthcare professional.